View of a courtroom ahead of the trial of Salah Abdeslam, one of the suspects in the 2015 Islamic State attacks in Paris, at Brussels Palace of Justice, Belgium, Jan. 30, 2018. After nearly two years in solitary confinement at a maximum security jail, the top surviving suspect of the deadliest terror attack in recent French history goes on trial Monday in Brussels. The four-day trial of 28-year-old Salah Abdeslam will not deal directly with the November 2015 attacks that killed 130 people around Paris, but rather a shootout with police months later. But it is being closely watched, in hopes it may shed insight into the tangle of alliances and events that link the Paris attacks with the March 2016 attacks on the Brussels airport and metro. The trial may turn on whether Abdeslam, who has remained silent for months under round-the clock prison watch, will finally talk or even make a courtroom appearance. "Will he say anything more than he has said?" asks Rik Coolsaet, a longtime terrorism expert and senior fellow at the Egmont Institute, a Brussels-based research group. "If he doesn’t, I’m afraid the trial will not make things much clearer about his involvement either in the Brussels or in the November attacks in Paris." The trial directly deals with a March 2016 shootout with Belgian police that took place days before Abdeslam was arrested, after months on the run. He and accomplice Sofiane Ayari face attempted murder charges. Abdeslam’s case comes amid a changing terror landscape in Europe. With the Islamist State group beaten back in Syria and Iraq, the focus is now on returning radicals and those leaving European prisons in the not-too-distant future. The Brussels trial is one of many expected during the coming months and years dealing with recent terrorist attacks across the region. But while the trials may shed light on the past, "they won’t inform us much about the future threats and challenges," analyst Coolsaet says. "We are living in a kind of post-ISIS era, in which the threat has been transformed from organized networks of plots and attacks to lone actors." A former pot-smoking petty criminal who once ran a bar in the Molenbeek neighborhood of Brussels with his brother Brahim, who blew himself up in the Paris attacks, Abdeslam seems an unlikely jihadist. His Belgian lawyer, Sven Mary, once characterized him as a ‘little jerk from Molenbeek’ with the "intelligence of an empty ashtray." Yet Abdeslam is believed to have played a key logistical role in preparing the attacks. He allegedly organized safe houses, drove across Europe to pick up other suspects, and dropped off three suicide bombers to the Stade de France soccer stadium outside Paris, where they blew themselves up during a France-Germany game. The stadium attack was the first in a string of shootings and bombings that took place across Paris on a warm November evening. The terrorists targeted bars, restaurants and the Bataclan concert hall before blowing themselves up or being shot dead by police. 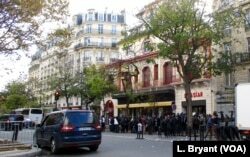 FILE - A crowd of mourners and journalists in front of the Bataclan concert hall. But Abdeslam escaped, sneaking across the French border into Belgium the following day with the help of friends. Recent evidence shows his suicide vest was defective, although it remains unclear whether he intended to trigger it. After a four-month manhunt, he was finally caught in the Molenbeek neighborhood where he grew up, just days after the shootout with police, who were investigating a suspected safe house they originally thought was unoccupied. 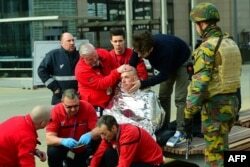 FILE - A victim receives first aid by rescuers, on March 22, 2016 near Maalbeek metro station in Brussels, after a blast at this station near the EU institutions caused deaths and injuries. Days later, three bomb attacks on Brussels airport and the Maalbeek metro station killed 32 people. The suspected killers were closely tied to the Paris attackers. Abdeslam, who initially talked during interrogations, and gave misleading information, has kept silent since. His silence ultimately led both Belgian lawyer Mary and Abdeslam’s French lawyer Franck Berton to give up his defense a few months later. Berton blamed the round-the-clock surveillance for eroding Abdeslam’s mental stability, and warned his former client was "radicalizing in an extreme fashion." In December, Abdeslam finally tapped Mary to resume his defense for the Brussels trial. Many questions remain about the Brussels and Paris attacks, among them the whereabouts of onetime Syrian jihadist and suspected coordinator Oussama Atar. An international arrest warrant is still out for Atar who, like Abdeslam, is a Belgian national of Moroccan extraction (although Atar is bi-national). He is also the cousin of two of the Brussels suicide bombers. The French and Belgian attacks were only the beginning of several killings across Europe that targeted Germany, Britain, Spain and the French Riviera city of Nice. Last month, the first trial relating to the 2015 Paris attacks opened in the French capital. Three suspects are charged with assisting or being aware of the assailants’ whereabouts. But the geopolitical landscape has changed dramatically in the interim. With IS weakened, terrorists in Europe cannot count on the same kind of extensive backing as the Paris and Brussels assailants once did, analysts say. European jihadists are also coming home, although in fewer numbers than earlier feared. "Returnees are not coming back here en masse, and that’s for the whole of Europe," says terrorist expert Coolsaet. "Either they’re fighting to death, or they’re being imprisoned." Yet other threats remain. That includes in overcrowded prisons which critics claim have long been breeding grounds for terrorists. For survivors and victims’ families, the Paris attacks remain painfully present. Jean-Francois Mondeguer lost his daughter Lamia, killed in a hail of gunfire as she was dining with her boyfriend at an outdoor cafe. Mondeguer is part of a survivors’ group called "November 13, Brotherhood and Truth." Before leaving for Brussels to attend Abdeslam’s trial, Mondeguer said, "I’m not angry with him, I don’t hate him, but I will never forgive him. What we want to find out is what exactly happened on November 13."